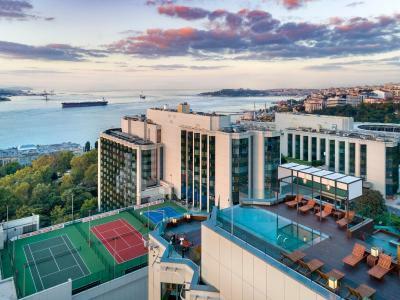 Lock in a great price for Swissotel The Bosphorus Istanbul – rated 9 by recent guests! Overwhelmed with there great service and hospitality . Special thanks to the Hotel manager Mr. Ahmet and his entire team from Ms. Zainab to the Bell service staff. The space,beautiful lobby with wonderful view.Succulent breakfast.Goid indoor pool.In the nice district of Maçka,çelişe tp the boutıques of Nışantaş. The prompt servive , cleanliness and not waiting for tips . Excellent & luxury hotel rooms is clean comfortable, the Beautiful smells fill the atmosphere, staff was friendly. Location is great, sultan gardens was beautiful. I recommend it for lovely staying. Every thing is perfect in this hotel, best location and services. Welcoming staff and kind housekeeping, trolly and people who are requesting taxi outside. They went above and beyond to ensure our comfort. They all felt like our family members especially Mr. Adnan Onur. I can't thank them enough on how they cared about every single detail. They surprised us with a cute cake on my husband's birthday. They supported us in anyway for celebrating our new year , and many many more things during our 14 nights stay. - friendly staff especially Malis and Zyneb. - excellent location with beautiful views of bospherous. 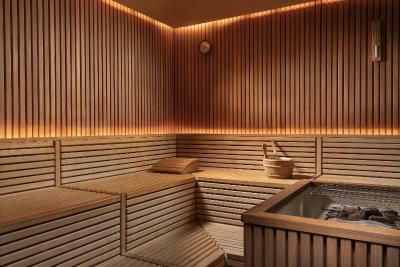 - Nice well equiped and clean spa - Easy Taxi facillities. - Very good breakfast with nice outside seatings. Wonderful, friendly, helpful staff. Rooms were spacious, clean and had a lovely view. 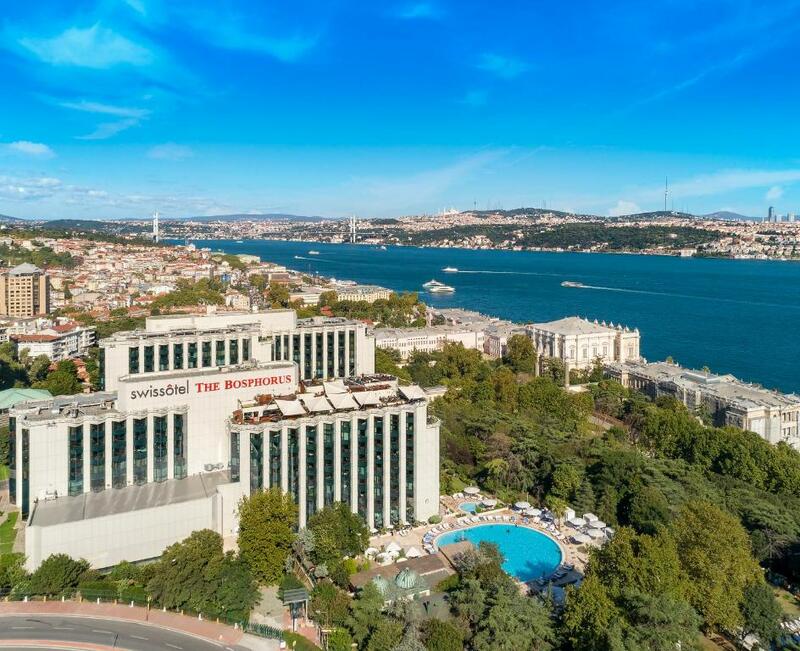 Swissotel The Bosphorus Istanbul This rating is a reflection of how the property compares to the industry standard when it comes to price, facilities and services available. It's based on a self-evaluation by the property. Use this rating to help choose your stay! 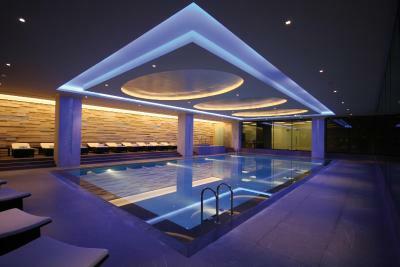 One of our top picks in Istanbul.Having Safe Hotels Executive Level Certificate for 2016 - 2017, Swissotel The Bosphorus Istanbul offers five-star luxury accommodations with its exclusive rooftop pool and award-winning spa. 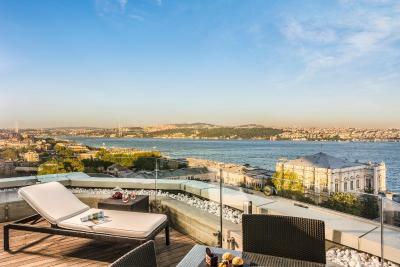 By the outstanding Bosphorus view, this property is within walking distance to Nisantasi where the main luxury shopping area is. 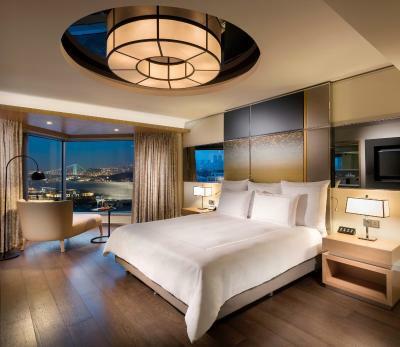 Tastefully decorated by world-renowned designer Khuan Chew with the touch of Swiss design and warmth of Turkish culture, all units in Swissotel The Bosphorus Istanbul feature state-of-the-art technology and exclusive amenities. Along with free WiFi throughout the property, working desk and seating area are available in all rooms for your comfort. Drinks and refreshments can be found in the mini-bars. Some rooms feature a walk-in shower while some have a bath tub. Decorated with authentic mountain lodge style, Chalet invites you to Swiss tradition accompanied by the fireplace. 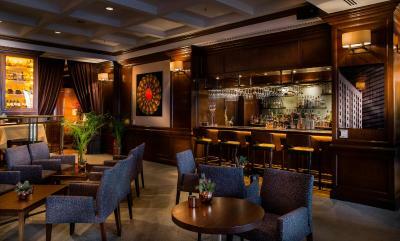 Les Ambassadeurs Bar allows its guest to savor their drinks while listening to jazz music. Purovel Spa & Sport offers luxurious holistic spa treatments including 14 treatment rooms, fitness center, indoor and outdoor pools. 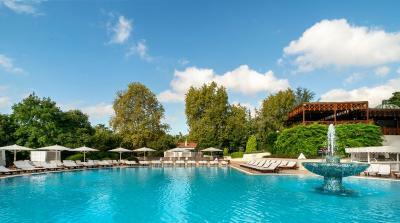 Guests can chill and enjoy the full range of hotel services including a tennis court. 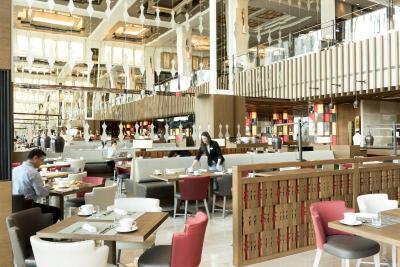 Many designer shops, exclusive restaurants, brands and lively bars are within walking distance. Istanbul’s historic area with the Topkapi Palace, Grand Bazaar and Blue Mosque is only a 15-minute drive from Swissotel The Bosphorus. Sabiha Gokcen International Airport is 26 mi away. 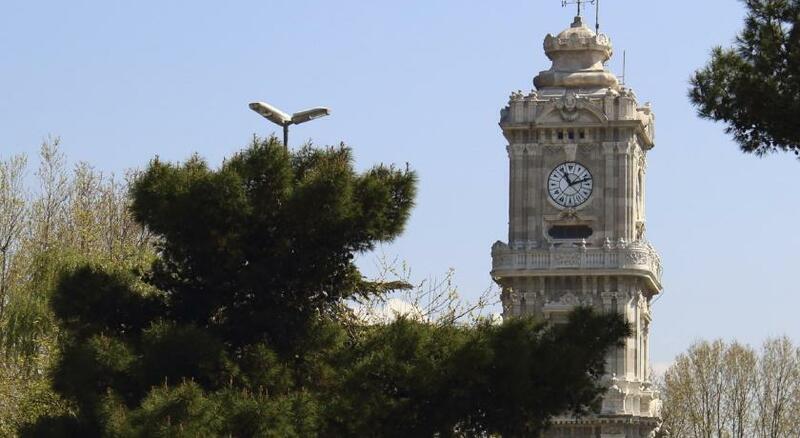 Istanbul Airport is 26 mi away from Swissotel The Bosphorus. 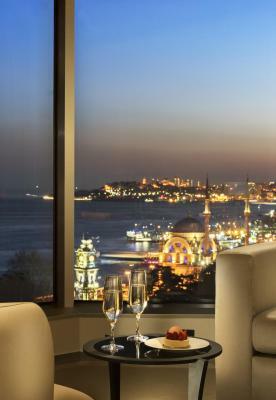 When would you like to stay at Swissotel The Bosphorus Istanbul? Elegantly decorated with the combination of Swissotel's design concept and Turkish touches, this terrace suite offers comfort and coziness. You can indulge yourself in the luxurious bath or enjoy your spacious living area. 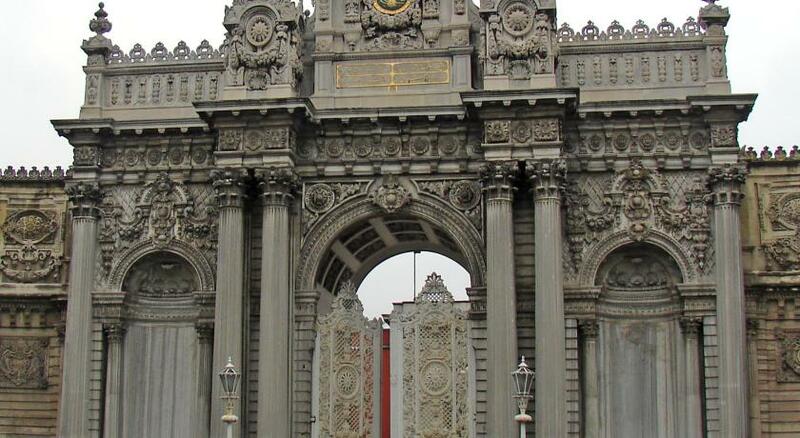 Accompanied by stunning Bosphorus view and tranquil views of the gardens adjacent to Dolmabahçe Palace, a private meal can be savored in the comfort of your room. Complimentary continental breakfast is served at Executive Lounge for guests staying in suite and executive rooms. 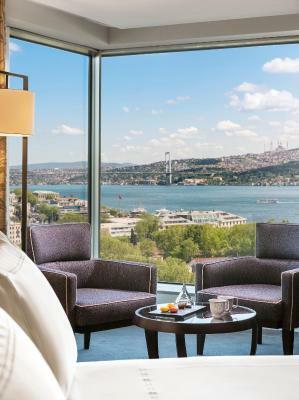 The suite has a breath-taking, floor-to-ceiling windows with views of Swissotel The Bosphorus, Istanbul’s very own gardens adjacent to Dolmabahce Palace. This is a stylishly-designed, modern residence. It includes a Nespresso machine.Complimentary continental breakfast is served at Executive Lounge for guests staying in suite and executive rooms. Corner rooms offer an exceptional, panoramic floor-to-ceiling window with view of Swissotel’s private 65-acre park or hotel entrance. 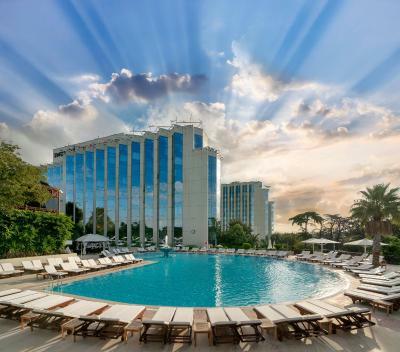 Experience the luxurious Swiss touch of Swissotel The Bosphorus, Istanbul with fresh, stylish and spacious accommodations in warm Turkish colors. Private bathroom is stocked with a hairdryer, bathrobe and free toiletries. Newly renovated, this spacious room with its modern, functional style mixes innovative, uncluttered Swiss design with the warmth of Turkish culture. 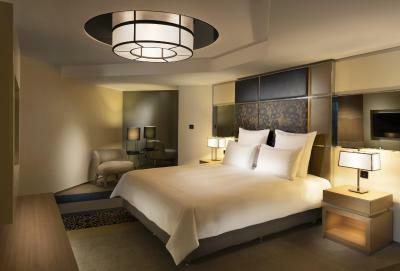 It offers floor-to-ceiling window with views of the garden or the hotel entrance and Swissotel’s lush, 65-acre gardens. Newly renovated, this spacious room with its modern, functional style mixes innovative, uncluttered Swiss design with the warmth of Turkish culture. It features floor-to-ceiling windows. 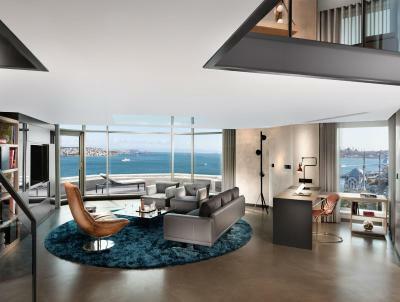 This corner suite offers a separate living area and panoramic views of the Bosphorus. It features a seating area, flat-screen TV with a DVD player, and a kitchen with a dishwasher and a stove. 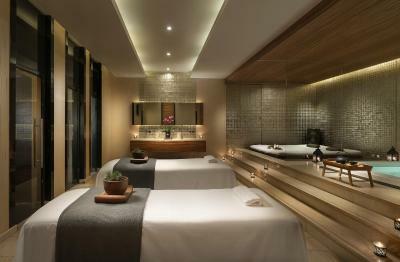 Please note that this unit is set in Swissotel Living building, a 2-minute walk from the main building. 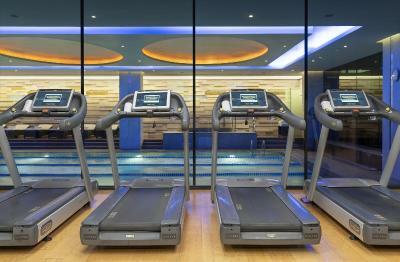 Common areas and facilities such as fitness center, main restaurant and the pool are located in the main building. 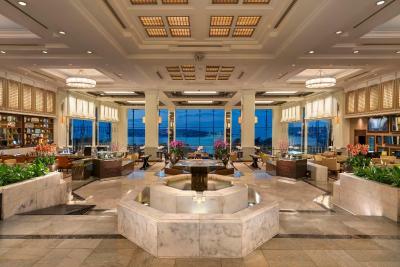 Guests staying in this residence have their open-buffet breakfast at Swissotel Living Residence. This suite offers scenic views of Maçka Park. It features a seating area, flat-screen TV with a DVD player, and a kitchen with a dishwasher and a stove. This apartment has a seating area, mini-bar and bathrobe. 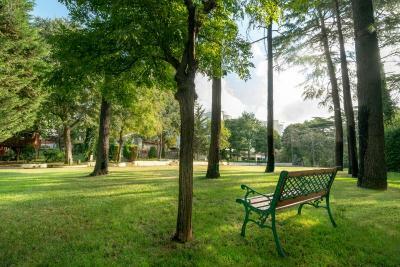 This studio offers views of Maçka Park. It features a seating area, flat-screen TV with a DVD player, and a kitchen with a dishwasher and a stove. This apartment has a seating area, mini-bar and bathrobe. Open buffet breakfast at Swissotel Living Lounge is served for Swissotel Living residence guests during their stays. 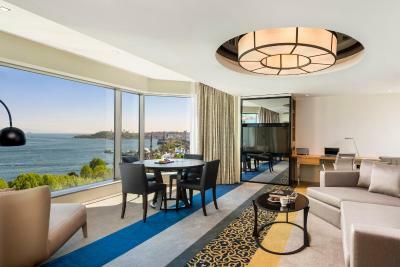 This suite offers 2 bedrooms, a separate living area, and panoramic views of the Bosphorus. It features a seating area, flat-screen TV with a DVD player, and a kitchen with a dishwasher and a stove. Open buffet breakfast at Swissotel Living Lounge is served for Swissotel Living residence guests during their stays. 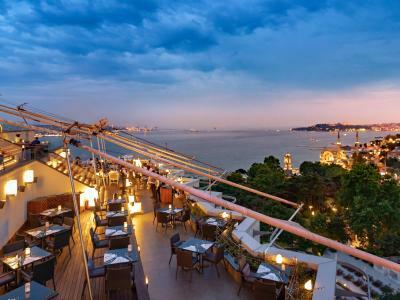 Across the Bosphorus from the old city to Asia, the amazing view from Swissotel The Bosphorus, Istanbul’s Corner Loft includes the major sights of the city. Inside the elegantly sleek designer loft, an exquisite blend of modern technology and warm comfort offers guests everything to make their stay beautiful. Complimentary continental breakfast is served at Executive Lounge for guests staying in suite and executive rooms. 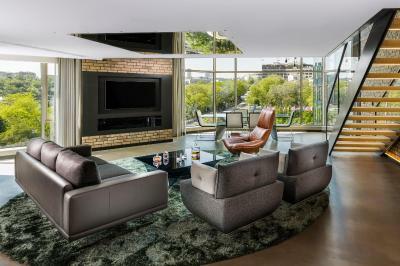 This luxury loft is designed for the ultimate modern comfort. You can rest and relax in a two-story gallery space divided into an elegant master bedroom above a sumptuous dining salon and living room. A cutting-edge entertainment center, a luxurious bathroom and an exclusive selection of amenities have been added to enhance your stay. 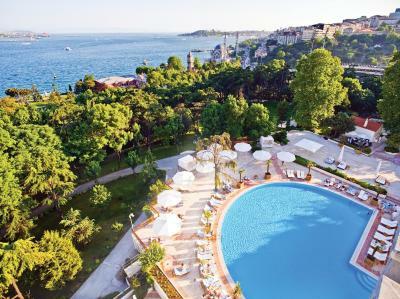 The magnificent 90-degree views of the Bosphorus, the old city or Swissotel gardens and Dolmabahce Palace are featured. Complimentary continental breakfast is served at Executive Lounge for guests staying in suite and executive rooms. 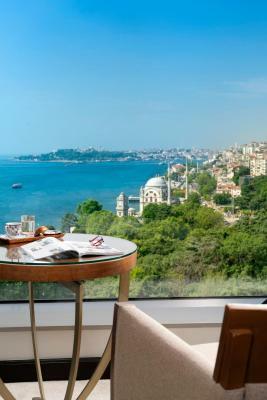 Corner Room Bosphorus offers an exceptional, panoramic floor-to-ceiling window view of the magnificent Bosphorus. Experience the luxurious Swiss touch of Swissotel The Bosphorus with fresh, stylish and spacious accommodations in warm colors, state-of-the-art, intelligent amenities and service that answers all your needs. Cabana Rooms are elegant, spacious and well-decorated. Their modern, functional style mixes innovative, uncluttered Swiss design with the warmth of Turkish culture. 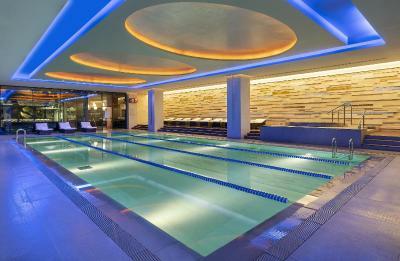 They offer fabulous floor-to-ceiling window views of the pool or Swissotel’s lush, over-250-m² garden. Catering for the needs of guests is served with high quality service. 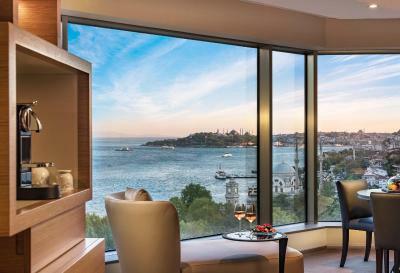 Boasting a Bosphorus view, 125 ft² of space, and a comfortable bed, executive lounge access is at the service of the guests for a pleasurable stay. 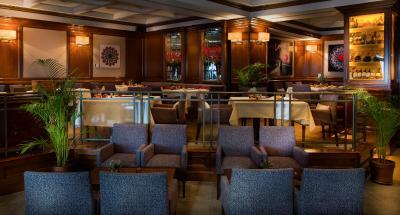 In the Executive Lounge, you can drink in Bosphorus views along with an afternoon tea or an evening cocktail. The elegant bathroom features a rain shower. Complimentary continental breakfast is served at Executive Lounge for guests staying in suite and executive rooms. 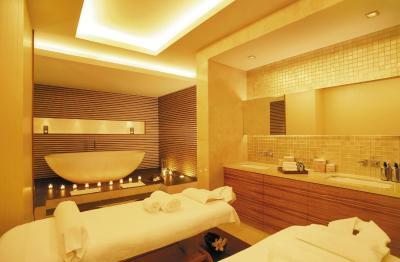 Commanding Bosphorus views, a hot tub and a king bed will make your stay pleasurable. For pastime, this suite features an HDTV, media panel and BOSE speaker. With free internet access, you will always stay in touch. Complimentary continental breakfast is served at Executive Lounge for guests staying in suite and executive rooms. 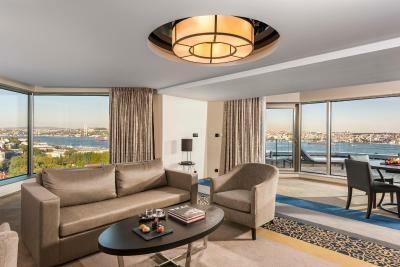 If you want the fresh air and view of Bosphorus in your room, Executive Terrace Suite comes with Swissotel’s design concept. You can delight in a luxurious bath that is your own private wellness space. 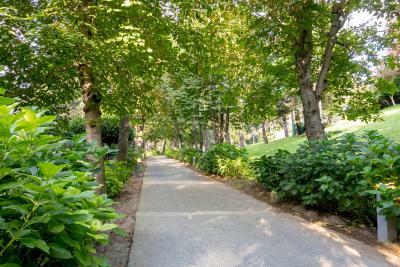 Overlooking the stunning Bosphorus and surrounded by the historical, over-820 ft²-garden adjacent to Dolmabahce Palace, you can enjoy your time in the romantic and luxury style. Complimentary continental breakfast is served at Executive Lounge for guests staying in suite and executive rooms. This apartment has a seating area, mini-bar and bathrobe. 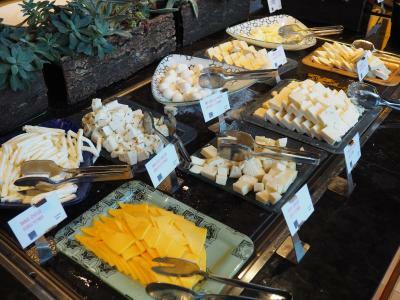 Open buffet breakfast at Swissotel Living Lounge is served for Swissotel Living residence guests during their stays. This apartment features a seating area, mini-bar and bathrobe. 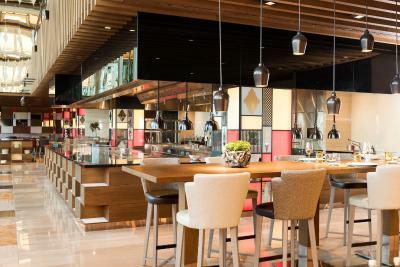 Open buffet breakfast at Swissotel Living Lounge is served for Swissotel Living residence guests during their stays. This apartment has a bathrobe, seating area and mini-bar. Open buffet breakfast at Swissotel Living Lounge is served for Swissotel Living residence guests during their stays. 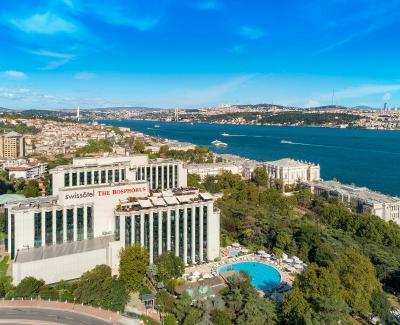 Swissotel The Bosphorus, Signature Loft Corner Park includes a superb garden view of Macka Park and the city or the Asian shores and the old city. Inside this elegant and sleek designer loft, an exquisite blend of modern technology and warm comfort offers guests everything to make their stay beautiful. And the view is not just limited to the front of the loft: those who enjoy a revitalizing bath will marvel at being able to see all the way across the Bosphorus to the old town from the tub. Complimentary continental breakfast is served at Executive Lounge for guests staying in suite and executive rooms. This luxurious loft connects to an adjacent room with its own bathroom for extra space. It offers complete comfort that combines modern design with cutting-edge technology. The air-conditioned lofts are divided into a spacious living and dining area, a master bedroom with an private bathroom and boast a gallery that is two floors high, enhancing the already breathtaking view. Complimentary continental breakfast is served at Executive Lounge for guests staying in suite and executive rooms. 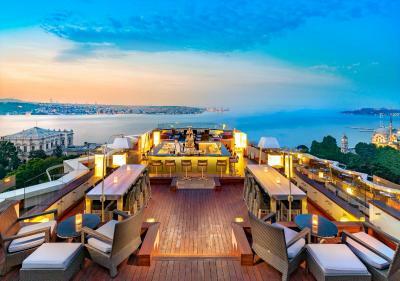 The private terrace offers a panoramic view that spans all the way across the Bosphorus, from the Maiden's Tower on Istanbul’s Asian side to the domes and minarets of the old town. The dazzling gallery is two floors high, giving the master bedroom a top-of-the-world feel. The spaciously-modern chic living area has a dining table that seats six and all state-of-the-art technology for your entertainment and business needs. 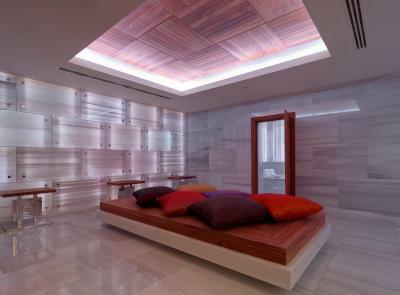 The master bathroom includes an exclusive steam room and sauna, providing a sumptuously revitalizing experience. Complimentary continental breakfast is served at Executive Lounge for guests staying in suite and executive rooms. Warm Swiss hospitality meets Turkish flair in our 131 ft² Swiss Executive Corner Garden Room. Here, panoramic floor-to-ceiling windows bring the garden in and leave the stress of everyday life out. With an HDTV, media panel, BOSE speaker, and free internet access you’ll have plenty of options for in-room entertainment. Besides a large work desk, your room comes with executive lounge access, where you can be inspired by both culinary treats and Bosphorus views. Complimentary continental breakfast is served at Executive Lounge for guests staying in suite and executive rooms. 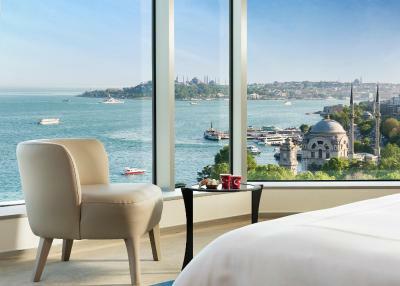 The 131 ft² Swiss Executive Corner Bosphorus Room features panoramic floor-to-ceiling windows featuring Bosphorus view. You can refresh in your rain shower or soak in your bathtub. A comfortable king bed is also available to ensure your comfort even while you're asleep. Room comes with executive lounge access where you can drink in Bosphorus views along with teas and cocktails or enjoy either a culinary masterpiece or a refreshing snack. Complimentary continental breakfast is served at Executive Lounge for guests staying in suite and executive rooms. 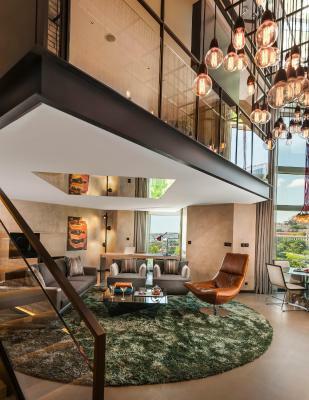 Commanding Bosphorus views and featuring small touches of Swiss and Turkish hospitality, you can sit in your living area or at your dining table and watch the boats go by. This suite’s HDTV, media panel, BOSE speaker, and free internet access will provide a variety of in-room entertainment while the king bed will make you feel like royalty. To relax, you can walk into your rain shower or soak in your bathtub. Complimentary continental breakfast is served at Executive Lounge for guests staying in suite and executive rooms. 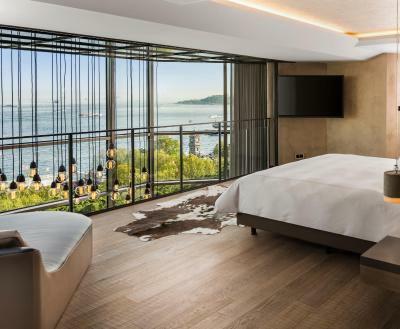 This suite has Bosphorus view, air conditioning, mini-bar and bathrobe. Complimentary continental breakfast is served at Executive Lounge for guests staying in suite and executive rooms. 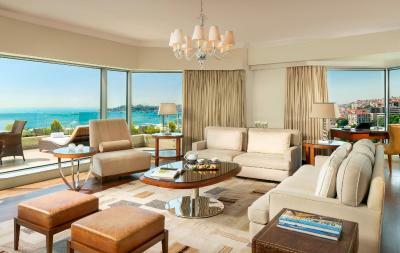 This suite features Bosphorus view, a bathrobe, seating area and air conditioning. Complimentary continental breakfast is served at Executive Lounge for guests staying in suite and executive rooms. Newly renovated, this spacious room with its modern, functional style mixes innovative, uncluttered Swiss design with the warmth of Turkish culture. It features floor-to-ceiling windows with garden views. Newly renovated, this spacious room with its modern, functional style mixes innovative, uncluttered Swiss design with the warmth of Turkish culture. 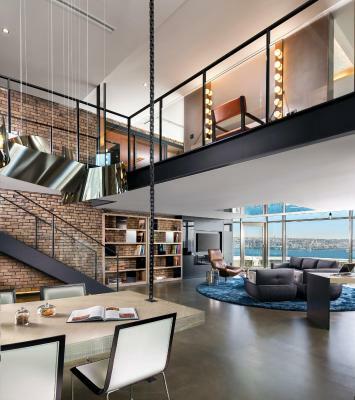 It features floor-to-ceiling windows with 90 degree views of the Bosphorus.